In the application, published by the U.S. Patent and Trademark Office as "Inductive power transfer using acoustic or haptic devices," Apple describes a common two-coil inductive charging system in which a dedicated transmitter coil interacts with a receiver coil in a consumer electronic device, like an iPhone. Unlike current solutions the invention does not require additional hardware, instead using existing coils from audio or vibratory feedback components. In some implementations, the device-side coil operates in two modes, one being the operation for which it's designed and another for inductive power transfer. Exemplary components include voice coils commonly used in conjunction with magnetic elements to produce sound in a speaker by exerting force on an acoustic membrane —or detecting force to capture sound in dynamic microphones —and haptic systems like Apple's Taptic Engine. The second coil, ostensibly attached to a charging mechanism or dock, might also serve dual purposes in a given component. As described, both the first and second coils may switch between operable and inductive charging modes or exist in both states simultaneously. Example of haptic device with coil and weight elements. Current can be applied to each coil at different frequencies in order to enable normal operation, which in the case of coil-and-magnet systems produces or detects some manner of motive force, and inductive power transfer. For example, a current applied to a speaker's voice coil at a first frequency causes it to move an attached membrane, thus producing sound. A second frequency dedicated to inductive power transfer would either not induce substantial movement of the membrane, or move it in such a way that produced sound waves are imperceptible to the user. Alternatively, in systems that employ a central electromagnet instead of a permanent magnet, first and second modes would see an electromagnet activate and deactivate, respectively. In other examples, the electromagnet can be activated to assist the transfer coil, receiver coil, or both, with power transfer operations. Finally, Apple's invention calls for an elegant docking solution that mates with one or more surfaces of the device. A multi-point docking mechanism would be necessary to access an iPhone's speaker and microphone coils, for example. 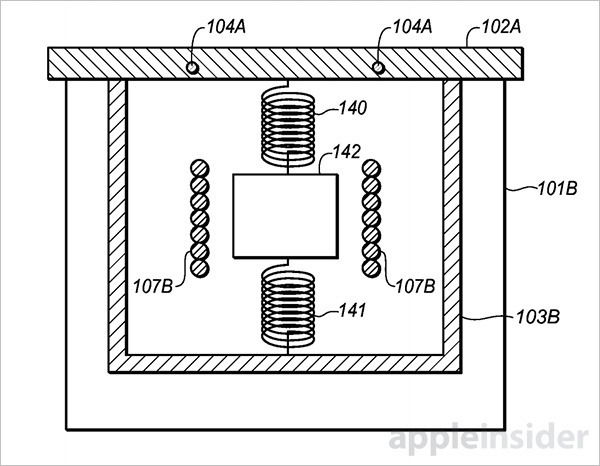 As described, Apple's proposed inductive charging system meshes nicely with its existing product lineup, which sport multiple speakers, microphones, haptic feedback engines and other coil-bearing parts. However, the relatively small size of each coil could negatively impact power transfer efficiency, resulting in unacceptable charge times for high-capacity batteries. 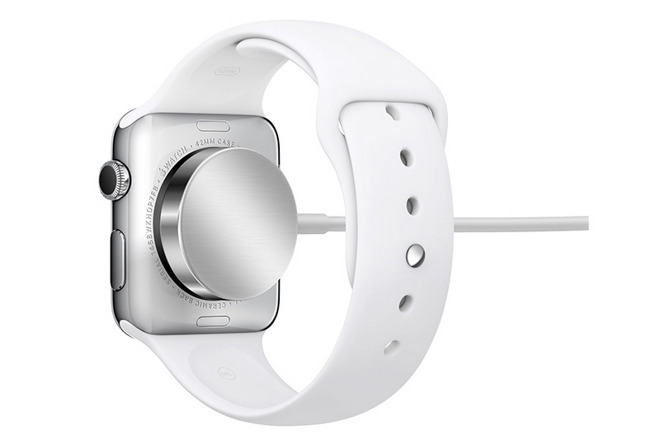 Apple's Magnetic Charging Cable inductive charging system for Apple Watch. Inductive charging systems are sensitive to coil diameter, distance, resistance and even shape. A good example of the current state of technology is the standalone coil in Apple Watch and its mate in Apple's Magnetic Charging Cable. Even with dedicated hardware the system is slow to charge, taking roughly the same amount of time to fully juice Watch's 205 mAh battery as a 5W power adapter does an iPhone 6s' 1,715 mAh cell. Apple's plans for inductive charging beyond Apple Watch are unclear, but if convention holds, the technology should trickle down to other products in one or two generations. Apple's inductive charging patent application was first filed for in April 2014 and credits Justin D. Crosby, Nikolas T. Vitt, and Gary P. Geaves as its inventors.